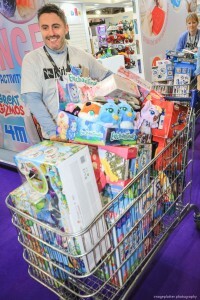 Home > KidsOut News > Toy Fair 2019 brings over 4,000 toys for KidsOut! Click here to visit our Facebook page for our Toy Fair 2019 gallery! KidsOut were once again thrilled to have attended the annual London Toy Fair this January as the event’s official charity partner. This year’s much anticipated “Trolley Dash” was another great success, collecting over 4,000 toys for disadvantaged children. The Toy Fair is the UK’s largest dedicated toy, game and hobby trade show taking place annually at the end of January at Olympia Grand and West Halls, London. The toy industry’s showcase welcomes more than 270 companies exhibiting thousands of products to visitors including retailers, buyers, media, and the wider industry. KidsOut has been the charity partner of Toy Fair since 2016, having its own stand at the event to promote the charity’s vital work in bringing fun and happiness to the UK’s most disadvantaged children. 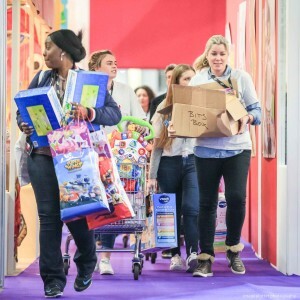 One of the most eagerly anticipated moments of every Toy Fair is the famed Trolley Dash, in which KidsOut staff and volunteers pass through the stalls for half an hour at the end of the final day to collect as many toys as they can from exhibitors. This year’s dash was enjoyed by all who took part and, most importantly, brought in over 4,000 brand-new toys for KidsOut. 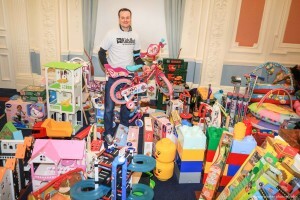 The toys donated will be sent to disadvantaged children via the KidsOut Toy Box service. Toy Box ensures that those children who are rehomed after spending time in a Women’s Aid refuge receive a brand new box of toys to call their own. These children are often relocated with very little possessions to an area away from family and friends, with the Toy Box providing a sense of normality and happiness in their lives. For more information about Toy Box, click here. The KidsOut team was overwhelmed by the generosity on display at this year’s Toy Fair and wanted to extend their gratitude to all those involved in the Trolley Dash. Thank you to all the exhibitors who kindly donated their products to KidsOut at the dash. Because of your support, thousands of disadvantaged children up and down the UK will receive some much needed fun and happiness in their lives. Special thanks must go Majen and Chris of the British Toy and Hobby Association for organising another fantastic Toy Fair and their continued support of KidsOut. Without them none of this would have been possible. Also not to be forgotten is Jo Lester, the venue organiser, and her team for magnificently managing the KidsOut team’s ever changing needs for access to the venue, parking, and logistics. Thanks is also warranted for Marks and Spencer for providing the huge lorry and delivering the donated toys to the KidsOut warehouse the following day. Additionally, thank you to Tesco in Cromwell road for lending the trolleys, as without this kind gesture the dash would have been very difficult and costly to organise. 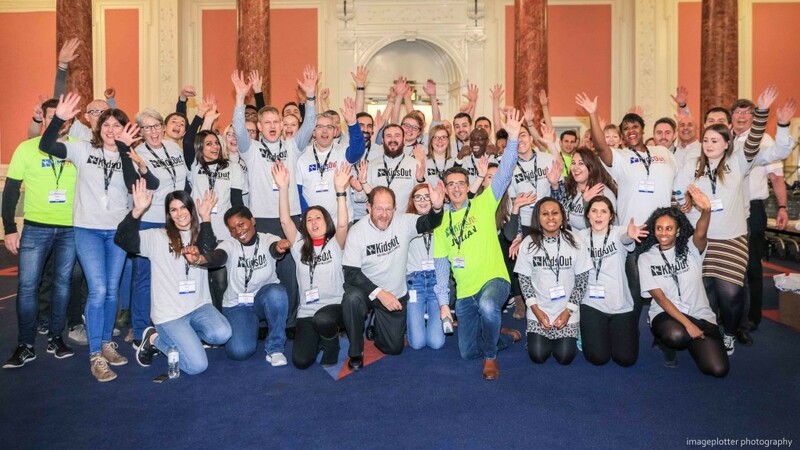 Last but not least, the KidsOut team wanted to show their appreciation to all of the 60+ volunteers who donated their time in a working day to come along and dash up the aisles, build and pack hundreds of boxes, scan and audit over 4000 toys and load them onto the lorry. Your energy and enthusiasm made the day extra special and the staff at KidsOut sincerely hope you all had a good time. Be sure to visit the KidsOut Facebook page for pictures from the event. All of these were taken by freelance photographer Chris Ongsiek completely free of charge and she can be contacted at imageplotter@googlemail.com. Thanks once again Chris. KidsOut can hardly wait for next year’s Toy Fair!